When it comes to home burglaries, the two main entry points are through doors or windows, in fact 66% of burglars gain entry to your property this way. Therefore, this blog will look at different doors and their security information, to help you maximise your entry point defence line, and deter those unwanted visitors. Composite Rockdoors are some of the strongest doors on the market. The range is different from your typical Composite Doors, as each Rockdoor features an ‘inner frame’ holding all of the locking components. This feature makes the door impossible to break down, and independent tests show that the Rockdoor range has unbeatable strength! The Ultimate Rockdoor range is the premium variety of Rockdoors. With their 3 star 6 pin ‘Secured by Design’ cylinder, which is the highest available, you can be assured that this door will withstand any impact- the only way you are entering through this door is with a key! The Composite range of doors all have the look and feel of a traditional wooden door. They are weighted to match a wooden door, and will not defect, twist or bow in reaction to seasonal changes. They have a GRP skin (a strong synthetic fibreglass) that is impact resistant and UV stabilised. The 44mm thick door panel is also timber lined to improve rigidity and security. These types of doors should come with an anti-pick, anti-drill, anti-snap, anti-bump cylinder as a standard, but with most things you could even upgrade your locking system further to improve your defence line. If you have glass in your door, this glass should be toughened as a standard, you could also think about adding frosting to ensure higher privacy for your home. We know that not everyone can afford a Rockdoor, or a Composite Door. So a High Security uPVC Door option is great if you have a smaller budget, but still want to feel content with your property’s defence. 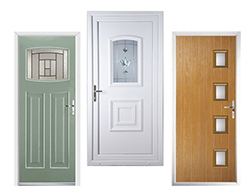 This range will offer you the same qualities as a uPVC door, just with upgraded security. The High Security variety of doors offer a 6 pin multi-hook locking system, which is anti-pick, anti-bump, anti-snap and anti-drill. The uPVC door range also offers energy efficient, secure doors. They have a 28mm uPVC panel, the glass units are toughened to keep your home warmer and safer and will come with a 6 pin locking system. If you are looking to upgrade the defense to your property there are many ways you can do this. These are just a few points to give you a detailed outlook on how strong the entry point of your home needs to be to help maximise security and keep those unwanted visitors away.